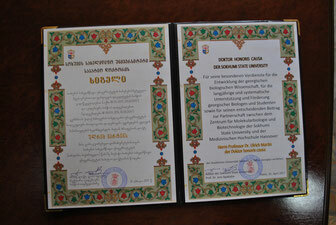 In a ceremony on April 13th 2017, Ulrich Martin, Professor at Hannover Medical School, Germany, and member of the international advisory board of the Center for Molecular Diagnostics and Biotechnology, was granted for this continuous strong support of science and education with an honorary doctorate degree by Sokhumi State University. 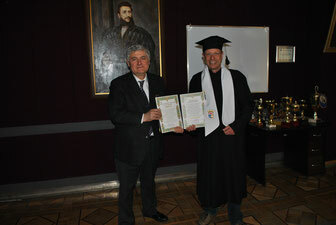 According to the order №03/04/03 of the President of Georgia, the Center for Molecular Diagnostics and Biotechnology (CMDB) at Sokhumi State University was awarded with 25.600 Lari from the reserve fund to support the ongoing project "Training Course - Molecular Methods in Biomedical Sciences”. On October 27th Prof. M. Pochkhua and Prof. U. Martin were invited as experts for a discussion about molecular diagnostics of cancer at the Dgis show, IMEDI TV. Inauguration of the Center for Molecular Diagnostics & Biotechnology at Sokhumi State University and opening of the Student Training Course “Molecular Methods in Biomedical Sciences”. On October 25th the Center for Molecular Diagnostics & Biotechnology (CMDB) at Sokhumi State University (SSU) was inaugurated in a festive atmosphere in freshly renovated lecture hall at Sokhumi State university. Prof. Johnny Apakidze, Rector of SSU, Prof. Ulrich Martin and Prof. Marina Pochkhua, director of CMDB, presented the new center and the new Student Training Course “Molecular Methods in Biomedical Sciences” to students, SSU faculty members and invited guests, including Mr. Gia Gvazava, Head of the Supreme Council of the A/R of Abkhazia, Mr. Baadur Mosidze, Medical Director of the Ingorokva Clinic, Mrs. Irina Kvachadze and Mr. Ramaz Chikhladze, Professors from Tbilisi State Medical University, and Dr. Merab Chikobava. CMDB was established in collaboration with Prof. Dr. Ulrich Martin, Hannover Medical School, Germany, and large parts of the equipment has been funded by the German Volkswagen Foundation. The aim of CMDB and the Training Course “Molecular Methods in Biomedical Sciences” is to provide state-of-the-art theoretical education and practical training in Molecular Medical Diagnostics & Biotechnology for selected top-class students of SSU, Tbilisi State Medical University and other collaborating universities in Georgia. For the 1st year, already 10 students were chosen for the program. The German Volkswagen Foundation granted our project "Practical Training in the Life Sciences at Sokhumi State University in Tbilisi". Volkswagen Foundation will provide 141.000 € for equipment and consumables to run a modern student laboratory at CMDB and to establish a training course "Molecular Methods in Biomedical Sciences" for selected students. 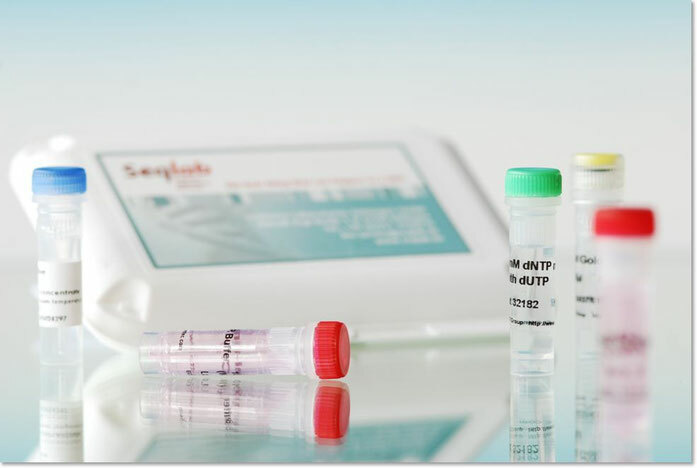 State-of-the-art molecular diagnostics and biotechnology are crucial not only in modern medicine but also in veterinary medicine, food production or agriculture. 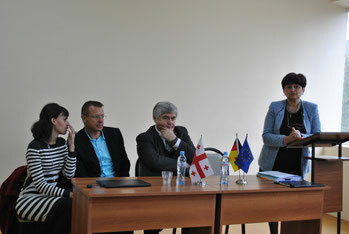 In Georgia, there is clearly a lack of state-of-the-art laboratories and well educated experts, especially in the academic sector. The Center for Molecular Diagnostics & Biotechnology (CMDB) was founded by Sokhumi State University in order to address this lack through providing expert knowledge and well-equipped laboratories for development of application-oriented academic biomedical research projects and education in life sciences especially on the undergraduate and graduate student level. მოლეკულური დიაგნოსტიკისა და ბიოტექნოლოგიის ცენტრი,სოხუმის სახელმწიფო უნივერსიტეტი, თბილისი.